THE PEST MANAGER app, launched in May 2015, is an identification and treatment tool that can be used to manage weeds, insects, and diseases in your corn, soybeans, or cereals. Pests can be searched by name or through the use of a key word in the ‘pests’ area. Any pest can be added to a user’s profile as a way to create a list of frequently encountered pests and they can be added to a geographic location using the maps feature. PHOTO: THE APP CONTAINS OVER 70 WEED SPECIES AND OVER 300 PHOTOS TO HELP YOU IDENTIFY WEEDS. PHOTO: YOU CAN MAP PESTS WITHIN A FIELD AND THEN SHARE THAT INFORMATION TO AN EMPLOYEE OR AN ADVISER VIA E-MAIL. PHOTO: BY SELECTING THE SPECIES THAT YOU WANT TO CONTROL AND IN WHAT CROP, THE APP LOOKS THROUGH ITS DATABASE TO IDENTIFY PRODUCTS THAT BEST MATCH THE TARGET PESTS. PHOTO: TAP ON A TREATMENT YOU’RE INTERESTED IN AND IT WILL PROVIDE ALL THE CRITICAL APPLICATION INFORMATION THAT YOU NEED. Management options for pests can be searched for in corn, soybeans, and cereals in the control section. These management options are currently only pesticide related. Integrated pest management options will be added in future versions. Pesticide options are ranked into by their average control of all pests selected. When a pesticide treatment is selected, a number of fields will be displayed with information for the appropriate use of the pesticide. If a user wants to look up information on a specific pesticide, they can do so in the ‘pesticide info’ section. Currently this app is only available for Apple (iOS) devices (iPad, iPhone, iPod touch) and can be found by searching ‘Pest Manager’ in the Apple app store. An Android version is in the works and will be released by the end of 2015. 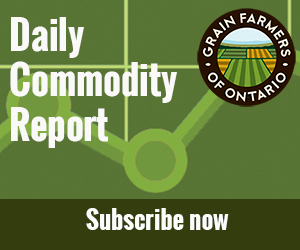 The app will also be integrated into Grain Farmers of Ontario’s Farm Central app. Pest Manager received a Canadian Agri-Marketing Association Best of CAMA?2015 award win in the mobile apps category.